Armed with charts, big ears, and a voodoo stick , Ross Perot found a way to persuade 16.5 million people in 1992 to watch his 30-minute infomercials that warned the economy was in danger of collapsing. 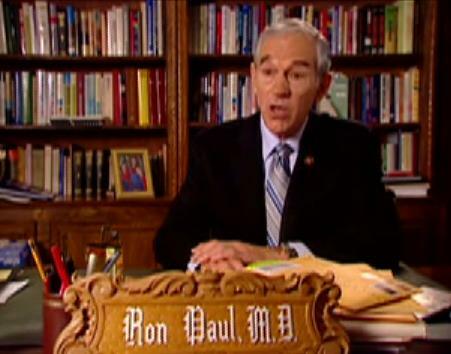 Armed with a giant name plate , bushy eyebrows, and 18 million fourth-quarter dollars, Ron Paul is trying to persuade a few thousand extra Iowans to watch his own 30-minute infomercials over the Christmas break. The symmetry is too ripe to ignore. Perot’s infomercials helped build his brand while also generating buzz around his campaign. Paul already found a way to do that without the help of must-see TV, and now he’s trying to make progress among early state voters. None of Paul’s half-hour spots (see Part 1 ; Part 2 ) is new to ardent Paul supporters. It covers the normal Paul points: The dollar is falling, immigration is ruining the economy, and the government is an obese bureaucracy that needs some liposuction. But it may make Paul seem more approachable for the uninitiated — a base that the Paul campaign desperately needs if it wants to start generating traction in the polls again. But what if Paul can’t convince voters by Feb. 6? By then the majority of states will have voted, but there will still be nine months until the general election. After Paul’s record-setting fund-raising haul yesterday , even the political elite can’t help but admit that he’s tapped into a rich vein of the Republican Party. And there’s more money where those donations came from — the 63,000 people who have given to Paul this week donated an average of about $100 each. So why not run as a third-party candidate to keep mining those resources past the primary? Paul has all of the ingredients of a tasty third-party run: pounds of money, a dash of organization, and a well-stocked cabinet of supporters. Now the main issue is finding enough time to let those ingredients bake in the political oven. Nine months is a lot of extra time for Paul to talk with voters and convince them that his platform is demonstrably different than the mainstream parties’. If the economy tanks, Iraq gets worse, and the Republican nominee isn’t a hawk on immigration (e.g. Huckabee or McCain), then Paul’s platform could resonate with voters nationwide. Plus, a general election helps Paul circumvent stalled momentum in the early primary states. Paul has said he won’t run as a third-party candidate. But Perot already made some of the inroads for him back in 1992. And not just on TV.